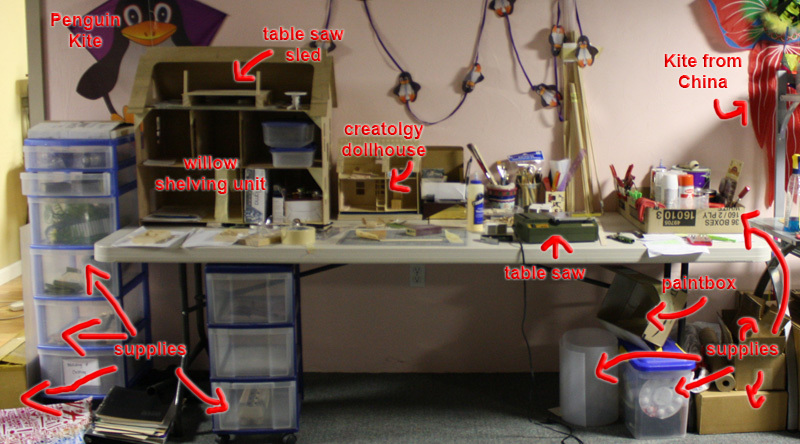 Remember that Creatology Dollhouse I wrote about last summer? Nothing has been done with it since that last post (else I’d write about it, right?) and it’s currently being used as a tiny shelf in my workshop space. You can actually see it here, LOL. I am at the point where I am seriously considering finishing it up, like, right now. I’ve been making a whole lot of furniture and art pieces for the past few months and now I am just DYING to work on and finish a house of some sort. Yes, the Nyne House is still around, but it has stalled due to waiting for supplies, ordering the wrong supplies then waiting for the second order of supplies, a poor workspace situation (too cold to work on it in the garage), and an overall lack of inspiration. Oh, and my back is hurting for no reason (about once a year, my back decides that it’d be fun to hurt like hell for two to three weeks), so that removes the thought of working on a heavy or unwieldy project. 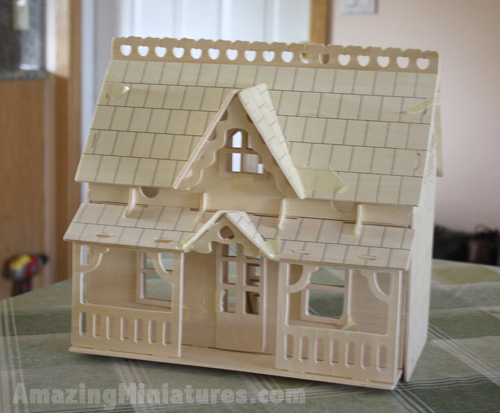 I figure a half-ish scale dollhouse would be a nice small project that can help placate my need to finish a dollhouse while not taking up too much room. Also, every time I visit Michaels, I usually buy a Creatology kit (they’re so cheap!). In all, I now have 4 of this particular kit sitting around. I may open a new one and dry fit it so I can create a set of pictorial directions for anyone that needs it. As for how I’ll be finishing it, I don’t care if its modern or not. I just want to finish a dollhouse. But to simplify things and to provide more room, the stairs are going to be removed completely. I would like to be able to finish everything indoors, which means no smelly chemicals or heavy tools. And the lack of heavy tools means I will have to keep the bashing to a minimum (I hope). I do want it to be somewhat realistic and to scale, so the whimsical look of the doors and windows have to go (along with the gingerbread moldings). I really do not want to have to buy additional supplies or materials to finish the house. I want to try to use whatever is on hand. Ever since I found this wonderful tutorial on using egg carton for mini stonework, I’ve been hoarding egg cartons like a big weirdo and I really need to get rid of some of them! I bought a whole case of these craft sticks specifically for 1:24 scale “hardwood floors” and I really want to use it for its initial purpose! So its shaping up to be a brick exterior, with a flagstone porch, (sand paper) shingled roof, hardwood floors throughout, printed wall paper (maybe? or just painted), no stairs, no gingerbread, and minimum bashing (non working doors). Thoughts? Suggestions? I’m really hoping I can finish all my custom orders this weekend and get started on a new dollhouse project on Monday. Maybe. I JUST used the sticks in MY creatology (the fantasy villa) house for floors and they look great. I also did Modge Podge covered paper for tile, which looks great. I know I said I would start the Washington, but it’s cold and I need space/time to dig it all out and start sanding. I am going to paper the walls in mine. Ha, another “together” project! Yah I feel you about starting big projects.. too dang cold to do any work outside! One day, I’m going to move to hawaii, I swear. Stucco the walls to go with the stones. It will look more realistic than papered siding. Great idea Karin!… hmm decisions, decisions..